I have a weird mental block when it comes to the stove. 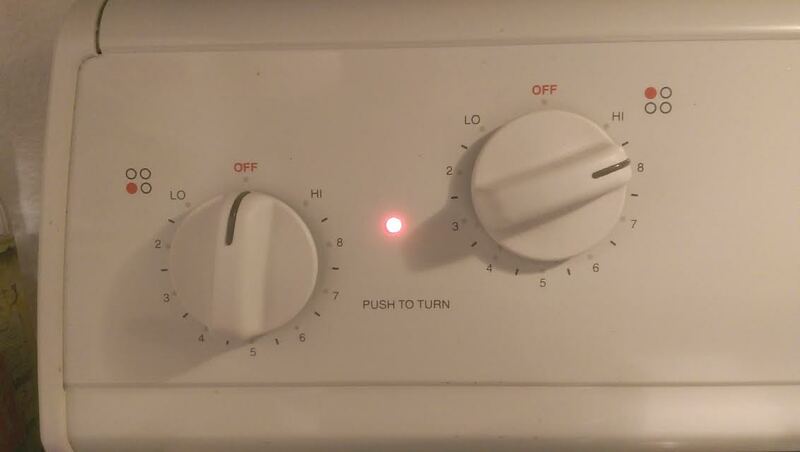 For some reason, I can never figure out which knob controls which burner. Ever. Not a week goes by where I don’t accidentally turn on the wrong burner, thinking that my pot or pan of whatever is heating up when, in fact, it’s the other burner – the one with nothing on it – that is getting hot. Usually I don’t discover this until I come back to check on the status of my food or liquid a good number of minutes later. I may be prompted by a tea kettle that has yet to whistle or pasta that is taking forever to come to a boil. It’s the little color-coded diagram beside the knobs that confuses me. I must live in an opposite world where front is back and up is down, because I get it backwards at least 30% of the time. The sad thing is, I know this going in, and mentally coach myself before turning the stove on (front burner, bottom left knob, Mark! ), and yet – more often than I’d like to admit – I screw this up and turn on the wrong damn burner anyway. A string of curse words inevitably follows because now we’re going to end up eating at 6:42 instead of 6:35 and that throws off the equilibrium for the rest of the day. Does anybody else have this problem?! The same thing happens with the oven sometimes. We have a weird one that requires you to push a START button after setting the temperature in order to turn it on and begin the preheating cycle. Many a time I have forgotten to hit START and come back ten minutes later to put a casserole in the oven only to find it cold and dark inside because I never turned it on. More curse words ensue. I think the problem is, I’ve never been a visual person. 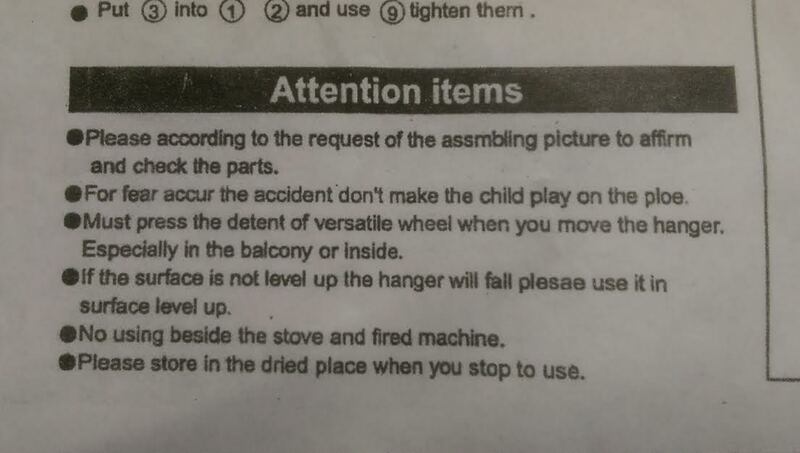 I respond much better to written instructions. Must be the writer in me! This is why I hate buying things from IKEA (with the exception of Swedish meatballs, of course): assembling them drives me up the wall. The instruction sheet invariably resembles hieroglyphics, with seven different kinds of screws that all look identical to each other. Don’t even get me started on the washers. Maybe there are people in this world who prefer diagrams to step-by-step directions, but I am not one of them. Tell me, don’t show me. I’d rather read it than see it. No wonder I always think the book is better than the movie! We are very appreciated that you purchased our products, please strictly obery tothe caution items during using, it is our willingness if you can use it proper, please confirm if the spare parts is full, also need assemble according to demands. Better yet, just shoot me now. I actually like diagrams for things like setting up a computer system…..printer, speakers, keyboard and the like. But I also had a lot of trouble with the burner pics on our stove at the old house which was similar to yours. I think the issue was that it was up above instead of being located flat on the surface of the stovetop like I have here. Not a problem for me now and I’ve got 5 burners! Glad to hear I’m not the only one who has trouble “reading”! I can definitely see how a flat-top burner would be easier to figure out. I guess when Tara and I end up with our dream home, we’ll make sure we have one of those. Yes! Me Too! That dern stove thingy! Must be a sort of diagram dyslexia. I wonder if that’s an actual medical condition? If not…it should be! Yes Mark, I also have this problem with the stove. BIG time! In fact, it happened to me just the other day when I put water on the stove to heat it for my French press coffee maker. I turned the stove on (what I thought was the correct burner) and then went into the bathroom to shave my face before having my coffee. Lo and behold, when I walked back into my kitchen area, I discovered that I had turned the wrong burner on. DUH! And when it comes to step-by-step directions, I much prefer opening a box and putting whatever is inside together myself, WITHOUT looking at the directions. Ha! I’m like you, Ron. I don’t have the patience for reading through detailed directions – I tend to jump right in instead, figuring it out as I go along. With mixed results, naturally. I’m not quite as bad, but I do feel your pain. We have a double oven, one on top of the other. One, you just turn to the temp you want it starts heating. The other, you set to bake, broil, etc and there’s a second nob for the temperature. BUT, if you don’t move that first nob it’s not going to heat up. I was cooking dinner and forget which nob did what and ended up not preheating my oven at all because I forget about that first nob and the “bake” switch. Grrrrr!